It was time to leave Petra. It was time to bike again. Weaving through town to leave was a mess. There weren't signs and our directions weren't clear. With a couple stops to ask directions, we were soon on our way. Those directions took us up a giant hill to the main road. Some of my worst fears about biking with Betty were realized when she got off her bike to push on the first major hill. I wondered if Betty and I had received a trip saving blessing by not having her bike show up those first few days. We would have had three days of 1000 meter climbs. I'm not sure I would have had the patience. I just kept pedaling and kept my mouth shut. So did she. These guys might be nomadic, but they are living in style. Check out the satellite dish. Rock formations along the King's Highway. We both knew what needed to be done. Just push onward. Once she got up the hill, she got back on her bike to ride. She lagged on the hills for the rest of the trip, but she never got off her bike again. In fact, with the exception of the uphills, her fresh legs and skinny tires had me working double time on the flats and downhills just to keep up. Her freewheeling was usually equal to my pedaling. I was jealous of her light bike, but the number of flat tires that she got made me happy to have my touring tires instead of her road tires. The road to Wadi Rum. Our ride to Wadi Rum was stunning. For half of it, we were on the King's Highway which doesn't see much traffic. We climbed 700m up to the plateau which offered great views to the west. Near the start of the descent to Wadi Rum, the police waved us over. They didn't want anything official. They just wanted to chat and offer us tea. A friend of theirs offered to take us to Wadi Rum. I was interested in accepting to get there a little earlier. However, another guy said it was only 25km. I checked my map. It said 56km. I showed it to the 25km guy. He said the map was wrong. The map turned out to be right. It was a long ride, but it was beautiful. The scenery became more sparse, but was broken up by huge rock formations that dominated the landscape. We arrived at Wadi Rum visitor's center two hours before sunset. 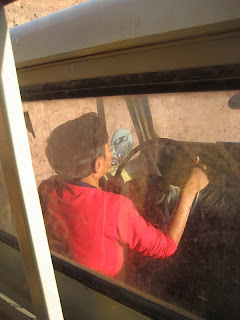 While we were there, we discovered there are three ways to see Wadi Rum: by foot, by camel, or by 4x4. We couldn't bike across even though my map showed a road and we also didn't have time for a hike. The camel idea seemed alright but, I wanted to maximize what we saw so we went with a 4x4 tour. There are one hour to multiday tours. It just depends what you sign up for. We took a 3 hour sunset tour with a fifteen year old kid that looked eleven. Our 15 year old driver (photo by B. Cremmins). The 7 Pillars of Wisdom named after T.E. Lawrence's book. Our first stop was a spring that T.E. Lawrence wrote about in his book the Seven Pillars of Wisdom. To the western world, Wadi Rum is most famously associated with the British officer T. E. Lawrence. The movie Lawrence of Arabia was about him and his assistance in the Arab Revolt. While he was involved with the revolt, he based out of Wadi Rum. The spring wasn't anything special to look at except for the fact there were plants growing there and no where else. Our driver offered us a drink directly out of the spring . . . . via a hose. It didn't taste great, but I suspect that had something to do with the hose. The entrance to Khaz'ali canyon. Our next stop was Khaz'ali canyon. It didn't seem like a canyon, but I'm not sure what a better name would have been. There are two giant red rocks that have a gap in between them. The elevation doesn't drop at all. I thought the elevation dropped in canyons. You can walk in between the rocks for about 200 meters before hitting a wall that you'd have to climb up and over. A rock climber could do it easily. I am not, so I didn't. On the way out, we saw a tour guide point out some 100AD Nabatean petroglyphs that we missed on the way in. It is amazing how much you can miss in a place if you don't know what to look for. Red sand in Wadi Rum. Our final stop on the tour was a giant red sand dune. We climbed up and watched sunset over the area. It was the best part of the tour. The red sand stuck out in the sandstone valley. The golden hour light was brilliantly illuminating the rock formations. We could see trucks driving and camels walking around which looked miniature compared to the rock formations. Before nightfall, we were another of those miniature trucks heading back to the village. The Wadi Rum village lets you pitch a tent for $1 a person. You get access to running water, a bathroom, a shower, and picnic tables to make your dinner on. The local market provided us enough food to get by and we gorged ourselves after a long day's riding. After eating, all I had enough energy to do was look at a few stars and fall asleep. Camping under those desert stars was my favorite night in Jordan. The desert road to Wadi Rum.